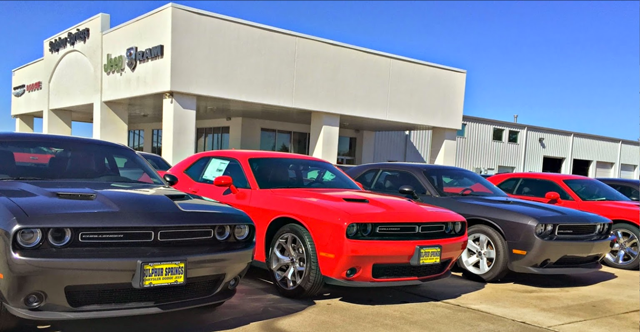 Sulphur Springs Chrysler Dodge Jeep Ram is Greenville, Sulphur Springs, Rockwall, Commerce, and Tyler, TX's preferred dealership and offers the best Chrysler, Ram, Jeep, and Dodge vehicles in the area. The Sulphur Springs CDJR team is proud to be an automotive leader in the area and strives to provide outstanding customer service in everything we do. Here at Sulphur Springs CDJR, you'll find a big selection of great new Chrysler, Jeep, Dodge, and Ram models that drivers of all styles and budgets will enjoy. If you aren't looking for a new car, we also offer a host of fantastic certified pre-owned Chrysler, Dodge, Jeep, and Ram models alongside great used cars from many different makes. Our staff members, from our management team to sales, service and parts, to finance, wants to make your shopping and car ownership experience as convenient and hassle-free as possible. We offer highly trained sales staff to help you pick out the perfect vehicle from our inventory. Our financing team will help you tailor an auto loan that fits your budget, no matter if you've never bought a car before, have bad credit or even no credit! In our service and parts department you'll get outstanding maintenance and repairs thanks to our skilled vehicle service crew. Sulphur Springs CDJR is here to serve you, so feel free to call us with any questions at (903) 885-2600 or to come visit us at 1505 Industrial Drive West in Sulphur Springs, TX.